[건강] "친구가 갑자기 쓰러져 발작을..."
Ex-President Park Geun-hye told prosecutors during questioning in her remand prison in March that she was "resting" after a hectic schedule, on the day the ferry Sewol sank off the southwest coast in 2014 killing more than 300 passengers. The Park administration was denounced for the botched response to the disaster, especially when it became evident that Park was nowhere to be found for a full seven hours while the tragedy ran its course. "I had grown very fatigued and wasn't feeling well. I was able to tend to my duties at my residence so I simply changed the venue of my work in consideration of my health," Park said according to the transcript obtained by the Chosun Ilbo on Tuesday. "I was briefed by National Security chief Kim Jang-soo and took all possible measures after realizing the seriousness of the situation," she added. When asked who was allowed into her residence that day, Park said her bodyguard and a beautician were the only people there at the time. There has been persistent speculation that Park was unavailable because she had been put under by one of the quack beauty doctors she clandestinely employed, perhaps as part of some kind of cosmetic procedure. Asked about her secretive relationship with her confidante Choi Soon-sil, Park said, "She was not interested in basking in the public's attention so I never imagined she would abuse her ties to me." In one poignant moment Park claimed Choi, who garbled many of her professionally drafted speeches, "had a knack for editing my words so that they could be better understood by the public." 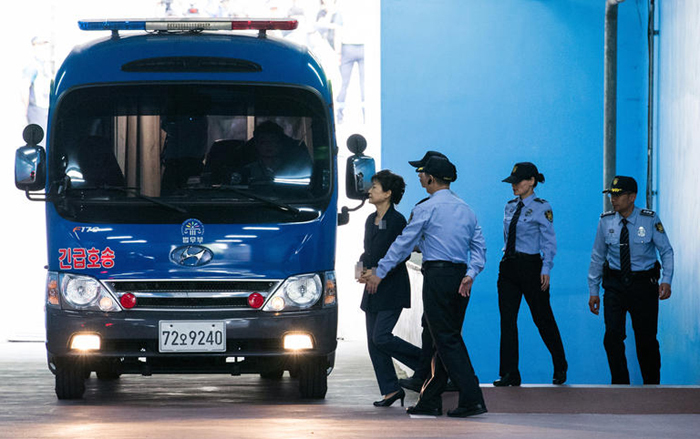 Evidence suggests that Park habitually messengered her speeches and other government documents, some of them classified, to Choi for approval as a matter of urgency. But she claimed that was all done behind her back. "I was unaware of so many documents being handed over to Choi Soon-sil by [presidential secretary] Jeong Ho-seong or why he did that," she said. As for Choi's daughter Chung Yoo-ra, who was allegedly a main beneficiary of her mother's enormous slush funds, Park said she only met her once when she was a child. "The only thing I knew was that she was an equestrian athlete," Park added. Park denied getting the drab outfits Choi procured for her from a drinking buddy free of charge. "I paid for all my clothes," she said. On the charge that she used a phone under an alias, which is illegal in Korea, Park pleaded ignorance. "My secretary told me it was a secure phone, and I don't even know the difference between a secure one and one that has been opened using another person's name." She also claimed only to have talked over the phone with Choi to discuss her "dress style and other private matters."